We woke up way too early on a Monday morning in order to head out to Chichen Itza (pronounced Ch-chen Eetza), one of the most popular tourist attractions in the Yucatan peninsula. Unlike the short walk to the El Rey ruins in the hotels zone of Cancun, the site is located across state lines about 110 miles from the hotels zone. We ate breakfast quite hurriedly and headed for the hotel lobby, where we waited for about 20 minutes for our transportation. 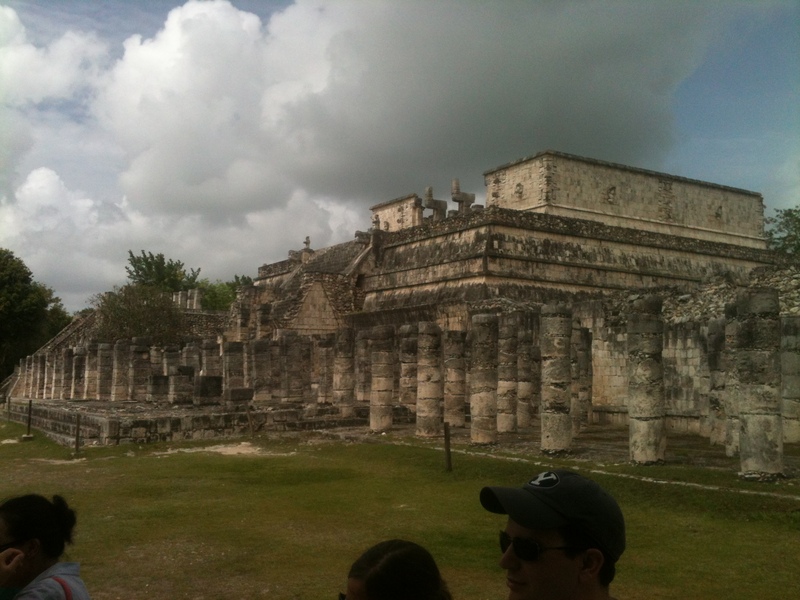 When it arrived, we were taken to a nearby staging area in a shopping mall where we had a cup of coffee as they organized the different tours for the day (groups were going to Tulum and other places). We were finally on our way at around 8 AM as we headed for the first stop of our tour – an underground watering spot called “cenote,” where the ancient Mayans performed religious rituals and also got water for their daily needs. A lot of the people in the group either swam in the cool water or took pictures (we did the latter) while exploring the area. I was a bit thirsty and headed to the bodega to get a beer, and later met with comments with some of my fellow riders, who seemed surprised that I was having a drink before noon. My deadpan answer was “it’s five o’clock in London” as I went back to my seat as we went for our second and third stops – a crafts shop and lunch. It took about 40 minutes to get to the store, where we found and amazing amount of crafts, ranging from silver jewelry, and sculptures in quartz, clothing and much more. We had already spent a bit shopping around, but we did buy two miniature replicas of “El Castillo,” Chichen Itza’s famous pyramid (one went to a couple we know). After that, we had a buffet lunch, where we were treated to a live show of typical dance from the region. The food was not exactly unique – my impression was that they didn’t want to scare American tourists with something that seemed too local (one person in line did ask about taquitos, and I was happy to explain), but it was quite delicious. About an hour after lunch we finally reached our final destination and waited around until our guide got all the tickets for our group, and we took the time to get a few postcards, browse the different gift shops around the park and of course buy some more water for the long walk. We were met inside the park by a regional guide who spoke English with a Brooklyn-like accent, who told us about the rich history of the site and the interesting phenomena around “El Castillo” and the different phenomena around it – such as the sound chamber built at the top that creates a feedback when people clap, and also about the shadow of a snake that appears to crawl the pyramid during the autumnal solstice. I was glad that we thought about bringing insect repellent – many of our fellow travelers were being attacked by mosquitoes in the park – it was a lesson learned from an earlier trip to the Dominican Republic. 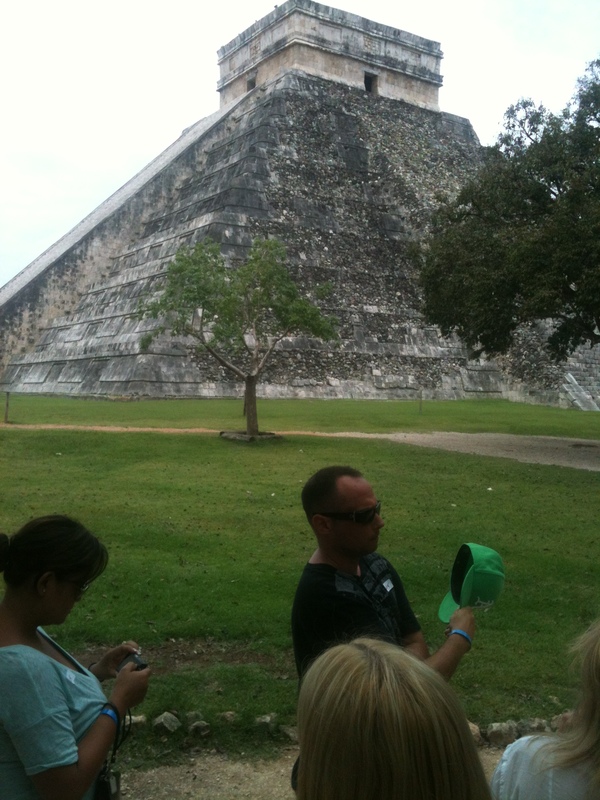 We also saw the site of an ancient Mayan ballgame called ulama – the stadium is still sporadically used for the game itself (which ends when the players run the ball through a hoop about 30 feet up) and also for concerts – including Luciano Pavarotti, Gloria Estefan and Paul McCartney, who will be performing there later this year. I later found out that our guide had never lived in the US, and that he had learned English thorough “extensive reading.” However, never elaborated on that and by then the tour had ended and we were left to our own devices for an hour and a half as we explored the premises and took pictures. It was very hot during the whole day, but some rain fell for a few minutes and cooled things down a bit. We had no umbrella, but the rain was not too intense so we walked around and saw more Mayan ruins around the park area until it was time to go. There was no time to see the cenote sagrado (sacred senote) of Chichen Itza, but we did purchase a book that detailed the history of the site and how it might have looked before the decline of the Mayan civilization. On our way back we slept on the bus until we reached the island of Cancun and were dropped off at our hotel. We were tired, and after dinner we basically attended the night’s show and went right to bed. 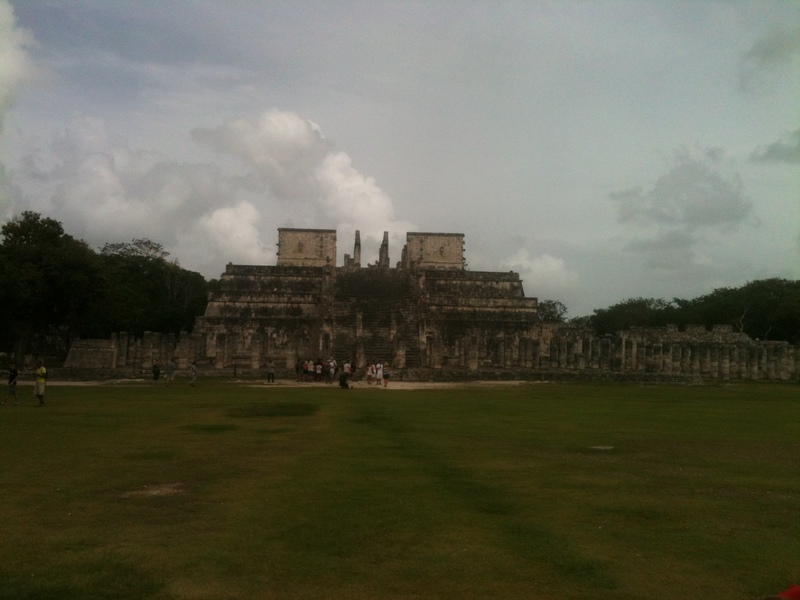 The trip to Chichen Itza was definitely the highlight of our visit to Cancun and the Yucatan Peninsula. It was wonderful to see this World Heritage site (and one of the Modern Wonders of The World with our own eyes.